There are many reasons why people turn to fresh raw milk from their local farmer as an alternative to industrialized, pasteurized, homogenized milk from the local grocery. Those who are tired of the abuses that go on in many large scale agricultural industries are looking for a way to provide fresh food for their family without compromising their moral and ethical standards. Others are looking for a healthier, tastier alternative to adulterated milk and meat from medicated and poorly fed animals housed in confinement operations. 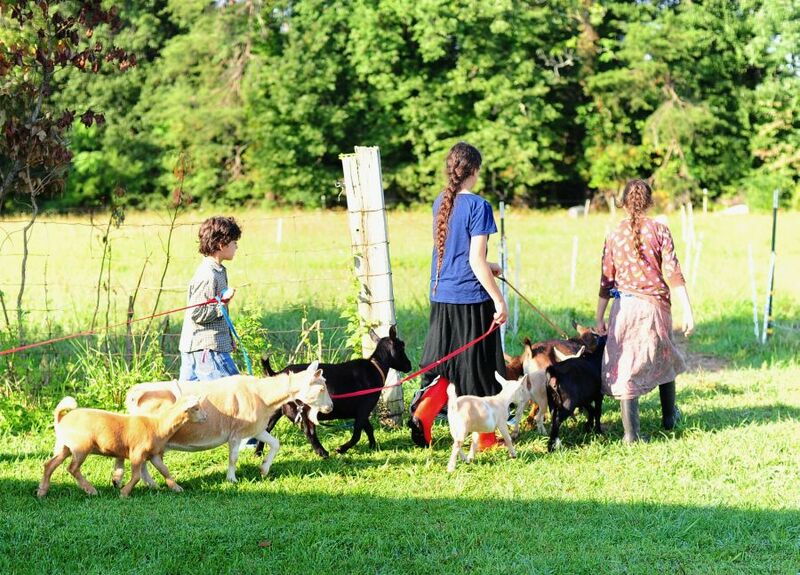 We are incredibly excited to be offering a herd share program whereby residents of Kentucky can share ownership of a herd of Nigerian Dwarf Goats and Guernsey cows and thus receive unadulterated, raw milk from healthy, pastured animals! In Kentucky, it is illegal to sell raw milk, but it is NOT illegal to drink fresh milk from your own animal. Cow and goat share programs enable families with the desire to drink pure, unadulterated milk to come together and share in the ownership of a herd of dairy animals. Faithful With Little Farm is contracted to board and care for these animals while shareholders are able to share and consume the milk from these cows and goats in proportions equal to that of their ownership interest. We take our responsibility as caregivers very seriously and do everything we can to ensure the animals here with us are healthy and happy. How are the Animals Cared For? The goats: One of the reasons we chose Nigerian Dwarf Goats for our own personal milk consumption is that milk from Nigerians really does taste better than the milk from any other breed. In fact, most people who have tried our goats milk and our cows milk side-by-side actually prefer the goats milk! The reason for this has to do with the milk’s butterfat content. Butterfat is what gives milk a sweet taste and Nigerian goat milk is higher in butterfat than milk from any other goat breed (6-10% as opposed to 2-5%) Goats milk is purported to have many advantages over cows milk, and can be consumed even by those who are lactose intolerant. 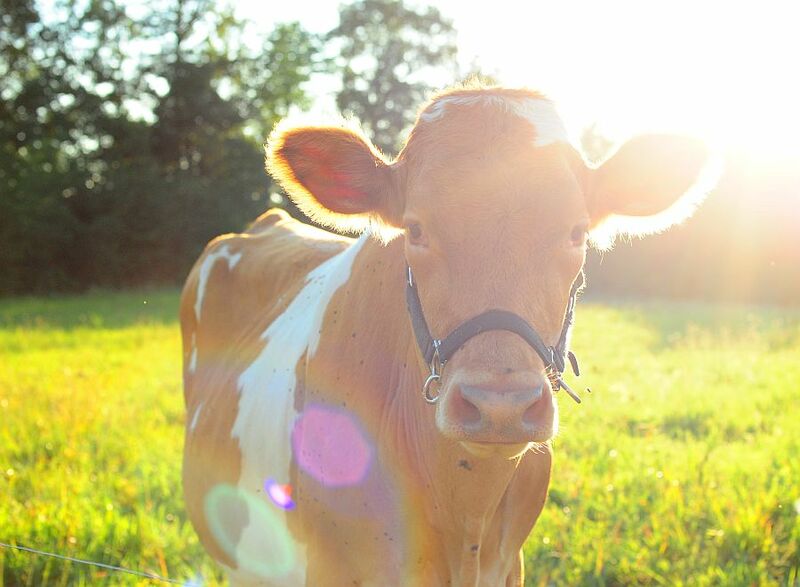 Guernsey’s are also the ONLY breed of cow which can boast a 98% production rate of A2 milk. In Devil in the Milk, Professor Keith Woodford explains the differences between ‘normal’ milk and A2 milk, linking A1 milk to higher rates of heart disease, type 1 diabetes, and a wide range of other physical and mental problems. Another large factor in the taste of milk is the type of grass or hay the animals are eating. Unlike animals living in confinement feeding operations, where feedlot managers can keep the taste of the milk uniform by feeding the same thing day in and day out (including waste products from the manufacture of human and animal food), our animals are given access to many different types of grasses and legumes. This means that the taste of the milk they produce will often vary from week to week, as they are moved to new pasture, and from season to season. Sometimes it will be sweeter, saltier, creamier, or (if they hit a patch of onion grass!) a bit off-tasting. This should be expected and anticipated as an integral part of consuming fresh, healthy milk. We are not an organic farm, but healthy animals are of the utmost importance to us and we do everything we can to keep our animals and their products free from all chemicals and medications, using herbal remedies, homeopathy and hydrotherapy to treat our animals whenever possible. Unfortunately, we have found it cost prohibitive to feed 100% organic grain but those lactating animals who are fed supplimental grain receive a non-GMO variety. If you would like to know exactly what we are feeding our animals at any given time we will be happy to give you a complete list of our food sources. Not only does pasteurization lower the vitamin content and destroy enzymes in milk, but many of those enzymes actually have antimicrobial effects. (In a humorous twist of irony, the FDA actually approved an enzyme present in raw milk [lactoferrin] as a spray to reduce E. coli outbreaks!!!) Many studies have linked consumption of pasteurized milk with health problems such as lactose intolerance, allergies, asthma, frequent ear infections, gastro-Intestinal problems, diabetes, auto-Immune disease, attention deficit disorder and constipation and other studies show that children fed raw milk enjoy a myriad of health benefits including: more resistance to TB; more protection against flu, diphtheria and pneumonia; better growth and calcium absorption; and fewer allergies, skin problems and asthma than children who drink pasteurized milk. Does this mean that all raw milk is safe? No, it doesn’t. All food carries some degree of risk. For our family, however, we believe the benefits outweigh those risks, especially considering that I have daily access to our milk cow and I know exactly how she’s being cared for. Milk from pastured cows contains an ideal ratio of essential fatty acids —omega-6 and omega-3’s. Studies show that those who consume roughly equal amounts of those two fats have a lower risk of cancer, cardiovascular disease, autoimmune disorders, allergies, obesity, diabetes, dementia, and various other mental disorders. Cows raised on pasture have an ideal, one-to-one ratio of essential fatty acids (vs. their grain-fed counterparts who have a 1:5 ratio, in favor of omega 6’s. Milk from pastured cows has up to five times more cancer-fighting CLA (conjugated linoleic acid) than milk from grain-fed cows and cows raised on pasture produce far less milk than cows raised on a grain-based diet, which is a good thing because the less milk a cow produces, the more vitamins are in that milk. Milk from super-cows bred to produce 10+ gallons a day on 20+ pounds of grain has a higher water content than milk from grass-fed cows, and far less nutrition. The beta-casein proteins found in cow’s milk are made of a string of 209 amino acids all linked together. The difference between A1 and A2 amazingly is just one of those amino acids. With A1 milk, number 67 is a histidine instead of a proline. This is important because Proline has a strong bond to a small protein called BCM 7, which helps keep it from getting into milk, so that essentially no BCM 7 is found in the urine, blood or GI tract of old-fashioned A2 cows. On the other hand, histidine, the mutated protein, only weakly holds on to BCM 7, so it is liberated in the GI tract of animals and humans who drink A1 cow milk. BCM7 interferes with the body’s immune response and has been shown to cause neurological impairment, especially autistic and schizophrenic changes, in animals and people exposed to it (16), (17). In animals injected with BCM 7 it has been shown to to provoke type 1 diabetes and heart disease (18), (19). In his book Devil in the Milk, Dr. Woodford presents research showing a direct correlation between a populations exposure to A1 cow’s milk and their rates of heart disease, type 1 diabetes, schizophrenia and autoimmune disease. Research has also shown that babies fed formula milk absorb BCM-7 into their blood. More importantly they have shown that some of the babies can get rid of the BCM-7 rapidly from their systems, but that other babies retain it in the bloodstream. Those babies who are unable to rapidly breakdown and excrete the BCM-7 from their systems are at very high risk of delayed psychomotor development and SIDS. There are more studies needed, and much is still unknown about this mutation (for instance, does it affect everyone, or only some?) but it is not impossible to find cows who test positive for the A2 gene and it’s not difficult to focus a breeding program around it, so we are making this a part of our long-term goals by selecting only A2 cows and bulls. How is the milk handled and stored? We generally milk two times a day at (roughly) 7:00 am and 7:00 pm. The milk is immediately cooled and strained into glass pitchers. We ask that our shareholders purchase half-gallon or quart (depending on share size) wide mouth mason jars with plastic lids, returning jars with every pick-up of milk. Glass does not hold odors the way plastic does, and is much easier to sterilize and keep clean. We ask that the jars be returned to us clean and washed out, so they are ready to filled with milk and refrigerated until your next pickup. How do I get my milk? For those who wish to come to the farm to pick up their milk, we will work together to plan a day and time that will be best for everyone. We are also able to deliver to Bowling Green on a limited number of days each week. If you are out of town or otherwise unavailable, you can arrange to have a friend pick up your share, or you can opt-out of your share that month. Please let us know in advance if you will not be available for a given month. Cow milk shares are $30.00 per month, and goat milk shares are $20.00 per month. Each share entitles you to two quarts of goats milk each week, OR one gallon of cows milk each week and you can purchase as many shares as needed for your family. We also offer half shares. A one-time fully refundable investment of $30 is also required to buy a share in the herd of Faithful with Little Farm’s Guernsey cows, and $20.00 for a share in the herd of Nigerian Dwarf Goats. Having said that, our goal is to provide clean, healthy foods to families in our area and we know that not everyone can afford raw milk prices! If you cannot afford our milkshare prices, but want to participate, please let us know and we’ll work with you and your family! YES! We encourage everyone to visit and see for themselves how the cows and goats boarded with us are kept and handled. Milking classes are also available. For reasons of safety, we ask that anyone who wants to come and visit make an appointment with us first, and we’ll be happy to schedule a day to show you around! Thank you for considering a herdshare with us, and we look forward to working with you in the future! We are located near Bowling Green, KY and would be happy to answer (or try to answer!) any questions you may have regarding grass-fed and/or raw milk, Guernsey cows, Nigerian Dwarf goats, Katahdin sheep or any of our chicken breeds, and milking! Please don’t hesitate to contact us at 27o-779-o445 or email Rina [at] RinaMarie [dot] com and we’ll do what we can to help! Hi, Kimberly, I’m so sorry I haven’t gotten your message! Are you looking for cows milk or goats milk?